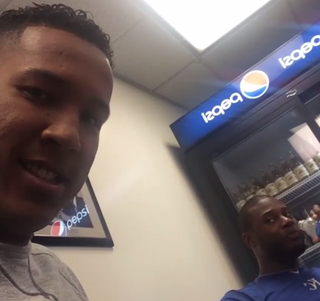 Royals catcher Salvador Perez has a habit of pestering teammate Lorenzo Cain by taking videos of Cain and posting them to his Instagram account. Occasionally, Cain reacts like Adrian Beltre does when someone touches his head. He really doesn't like when Perez calls him "hermanito." And two from yesterday. Perez's face is priceless.